VERY OLD PAPIER MACHE DOLLY? 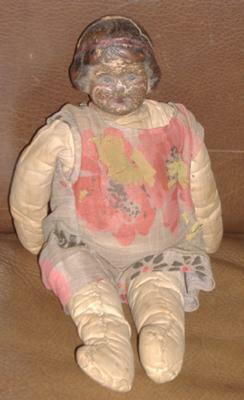 Hi, I found this old dolly in mum's attic and I know nothing at all about her. She has a crack on her head which I think could be easily mended and her body is made from straw. Her arms and legs are made of cloth. Her face is quite dark and I don't know what might have caused this and she is quite grubby. Well, a good cleaning and I think she could look great. She is for sale on eBay at present, along with the other dolls I found.